The Toddler & Kids Pillow by Snuggle-Pedic is a smaller version of the top-rated Snuggle-Pedic Ultra-Luxury Shredded Memory Foam Pillow (Ultra). While the Ultra comes in three sizes, Standard (20”x26”), Queen (20”x30”), and King (20”x36”), the Toddler & Kids is smaller, 18×13 inches. Whereas sizes for adult pillows are standardized, those for children’s pillows are not. Basically, a kids pillow is smaller than Standard. Like the Ultra, the Toddler & Kids is filled with shredded memory foam, a mix of regular memory foam and Biogreen Memory Foam. These are the same foams used in Relief-Mart’s mattresses sold under the Selectabed, TempFlow, and Snuggle-Pedic brands. Memory foam trimmed from slabs for these mattresses is shredded for use in the pillows. The regular memory foam is certified by CertiPUR-US as free from heavy metals (such as mercury and lead) and harmful chemicals (such as phthalates) and low in volatile organic compounds (VOCs). The VOCs in Biogreen Memory Foam were measured in tests at UL labs as 00.039 mg/m³, which is less than 1/5 the level permitted by the strictest VOCs standard, GreenGuard Gold. Shredded memory foam has several advantages. Like down, it can be reshaped for the individual user. Unlike down, it holds its shape, does not fall flat. It is softer than solid foam, yet supportive. It is also cooler than solid memory foam, even ventilated foam. For children who differ in size, and are also growing, this means a pillow can be molded to the child, then re-adjusted as the child’s size increases. The Snuggle-Pedic Toddler & Kids Pillow is the same Kool-Flow knitted fabric used on the Ultra and the Body Pillow by Snuggle-Pedic. It is a blend of 43% rayon from bamboo, 56.4% polyester, and 0.6% lycra. Knitted in are micro-vents. These let more air flow through the cover for enhanced ventilation. This helps keep the pillow both cooler and drier. Lycra gives the fabric more stretch so it better conforms to eh head and neck of the sleeper. 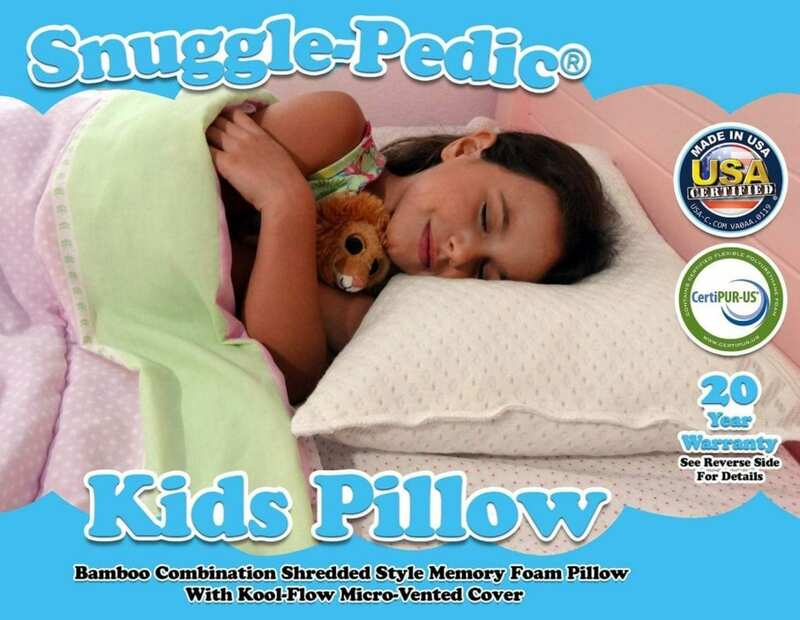 The Snuggle-Pedic Toddler & Kids Pillow is described on the Snuggle-Pedic site, but it is sold on Amazon, as are the other pillows and the mattress. The Snuggle-Pedic Toddler & Kids Pillow has the same 90-day sleep trial period and 20-year warranty as the other pillows by Snuggle-Pedic. The overall average customer rating on Amazon for the Snuggle-Pedic Toddler & Kids Pillow is 4.5 (4.54) out of 5 stars. However, it is 4.6 (4.56) for verified customer reviews (VCRs) – those by customers who actually purchased the product on Amazon. Of 118 VCRs, 93 (79%) rated the pillow with 5 stars. This compares with the 4.5 (4.49) average VCR rating (4.50 for all reviews) for the Snuggle-Pedic Ultra Shredded Memory Foam Pillow. This very slight difference may be accounted for by the greater percentage of adults with neck and back problems coupled with heavier body size. 4.7 (4.65) is now the highest average customer rating for children’s memory foam pillows with 100 or more customer reviews, of which there are only four. The highest is the Milliard Memory Foam Toddle Pillow with 102 customer reviews (100 VCRs). It shows the 4.7 (4.65) average, with 79% of the VCR ratings 5-stars. However, it has had only two more reviews (both 5-star) over the past two months, while the S-P Kid’s has had 12 more, and with fewer reviews, one or two more have a larger impact on the average ratings. The Milliard differs in construction, being a contour pillow with three layers of ventilated memory foam. Also, the cover is 75% cotton. It is not as versatile as the Snuggle-Pedic Toddler & Kids Pillow, but the height can be adjusted by taking out one or two layers. Comes with great customer support, a long sleep trial and warranty. Customers reviewing the Snuggle-Pedic Toddler & Kids Pillow noted a number of things they did or did not like about it. As with other products, some of these pros and cons are offsetting. The most mentioned pro for the Snuggle-Pedic Toddler & Kids Pillow is how it fluffs up when put into the dryer as directed for 15 minutes before the first use. Since the pillow is shipped compressed and rolled, this is needed for it to fully expand after opening the package. Related to fluffing up is the soft support it offers. Not only do they say it is suitable for their children, some of the adults also buy this for their own use, such as under the knees while lying down or behind the back or neck while sitting. Also noted was how quickly the odor dissipated. For many of the customers’ children, this pillow was the right size. Most of the cons for the Snuggle-Pedic Toddler & Kids Pillow are the reverse of the pros. For one thing, children as well as adults differ in size and preferences. A number of reviewers said the S-P Kids Pillow was too narrow for their toddlers. This may be related to how big these toddlers were, but it could also relate to their sleep patterns – for instance, a more active sleeper may require a wider pillow than a still sleeper. A few reviewers said the pillow was too firm. The overall average verified customer rating of the Snuggle-Pedic Toddler & Kids Pillow is 4.56 (92%).